QUESTION AND ANSWER ACT-This act is worth the price of the whole series! Questions are written by the audience and collected in open view. Still the mentalist answers them in an impossible way! Not only is this act new and stunning, it is the simplest Q&A act of them all! You will LOVE this! TEST CONDITIONS II-Remember the Test Condition Card Effect from Richard's first series? This is another effect with the Breakthrough Card System that will floor even advanced card men! You find a chosen card under impossible conditions after the spectator returns the card himself and shuffles the deck!TRIBUTE TO TARBELL-A spectator thinks of a card. Another spectator brings her hand down on the spread deck and finds the first person's card! A killer anytime, anywhere mystery!PSYCHOLOGICAL IMPOSSIBILITY-A mentally chosen card mysteriously vanishes from one half of a deck to appear in the performer's pocket! See how Richard takes a standard effect and turns it into a major mystery!MATCHBOOK PREDICTION-This is one of the most entertaining and mysterious card effects you can do! A chosen card appears on the inside cover of a book of matches not once-but twice! The audience howls with delight! ESP STACK-Richard shows his new ESP stack and how it is used to duplicate the actual tests devised for these cards. This routine looks just like the real thing!OSTERLIND DESIGN DUPLICATION (ODDS)-Richard's revolutionary method of doing the design duplication effect. This routine was developed based on actual laboratory techniques for testing ESP and is the closest thing to real ESP!ASHES ON THE ARM-The classic effect is updated by Richard. A spectator writes the initials of a family member on a piece of paper which is burned. The ashes from the burned paper are rubbed on the mentalist's arm (or hand) and the initials appear in the ashes! This looks uncanny! PEN PADDLE MOVE-This is Richard's trademark routine which he uses in trade shows. The writing on a pen repeatedly appears and vanishes. You will be amazed at the effect Richard achieves using this classic principle!DAD'S FAVORITE-The spectator cuts a deck of cards over and over into four final piles. The top cards are turned over and found to be the four Aces! 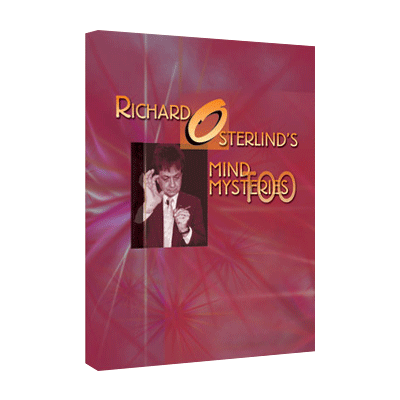 This amazing effect was actually taught to Richard by his father when he was a young boy! HAUNTED KEY-Richard performs the classic Haunted Key effect using the methods from his classic book, Making Magic Real. You will see how the key turns over with no movement of the performer's hands!SOLID GHOST-This classic is one of Richard's favorites! A solid ghost appears inside the dark recesses of a folded handkerchief! It is tapped with a spoon and felt by a spectator before it disappears back into nothingness! Watch how Richard uses this to close the show!